The Grammy-winning singer-songwriter will perform for Melbourne audiences on Thursday 21 March at Rod Laver Arena before heading up the coast to perform at Wollongong’s WIN Entertainment Centre on Friday 22 March and Sydney’s ICC Theatre on Sunday 24 March. He will also perform two very special a day on the green shows at Bimbadgen in the Hunter Valley and Kings Park & Botanic Garden in Perth. He will be supported at all shows by special guest Mahalia Barnes. As an icon in the industry, Adams is well known for his signature brand of feel-good rock’n’roll hits, having achieved a string of number ones in over forty countries and having sold over sixty-five million records worldwide. He released Ultimate last November, a celebration of a number of his classic rock ballads that have spanned the length of his four decade long career, including hit singles ‘Summer of ’69’, ‘(Everything I Do) I Do It For You’, ‘Heaven’ and his Rod Stewart and Sting collaboration ‘All for Love’. The album also featured two brand new songs ‘Ultimate Love’ and ‘Please Stay’, Adams’ first new music in more than two years. Over the course of the last forty years, Adams has collected an impressive number of achievements including a Grammy, three Academy Awards and five Golden Globe nominations. He was also awarded the Order of Canada and the Order of British Columbia for his contributions to popular music and philanthropic work through his foundation, The Bryan Adams Foundation. As a long time Australian touring favourite, Adams is no stranger to being on the road. Currently on tour throughout Europe, he will also perform for audiences in Canada, the UK and New Zealand before heading to Australia next March. Currently working on his forthcoming album, fans can look forward to new music from the legendary rock singer sometime in 2019. More information to come. 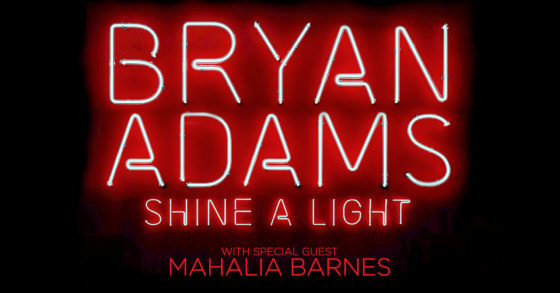 Joining Adams across all shows will be Australian singer-songwriter, Mahalia Barnes. As the daughter of one of Australia’s most successful vocalists, Jimmy Barnes, Mahalia has inherited a powerful, soulful voice that will delight audiences as she takes to the stage. Mahalia released Hard Expectations earlier this year with her band The Soulmates, recorded at Freight Train Studios in Botany and mixed at Apple Street Studios in Berrima by Benjamin Rodgers. She also performed on several tracks across Jimmy Barnes’ Working Class Boy (The Soundtracks) released this past August. As one of the most loved performers of the last forty years, tickets for Bryan Adams’ upcoming Australian tour are sure to be snatched up quickly. Fans are urged to secure tickets quickly to avoid missing out! We cannot guarantee any ticket purchase made through any means other than the official ticketing agents listed on the Frontier website.